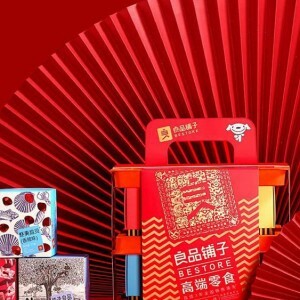 Chinese New Year is Coming, Is BESTORE’s Gift Pack Big Enough For Competition? RESTORE employed popular Chinese celebrities to promote its Chinese New Year Gift Pack, launched a series of the tumultuous marketing campaign, are they going to win in this year's New Year Shopping Frenzy? Sent its IPO Prospectus Paper in 2018; employing the expensive hot faces, such as Dilreba Dilmurat (迪丽热巴) and Kris Wu (吴亦凡) to promote its high-end snack products prior to the Chinese New Year Festival Shopping Season; Spending large sums in packaging design. 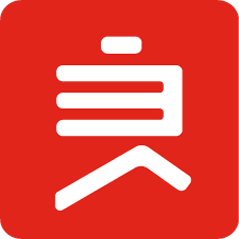 It seems BESTORE (良品铺子) is making all possible efforts in readying itself for IPO this year. The Chinese New Year is looming ahead, all snack companies had prepared their best shots, a variety of gift packs. Is BESTORE's preparation good enough for the New Year Shopping frenzy? First, a comparison of the price of the nut snack per kilogram offered by the three brands: Three Squirrels, Bai Cao Wei, and BESTORE. The nut snack being a bundle consists of several different types of common nuts, such as pecans, almonds, walnuts, hazelnuts and so on. Collecting the pricing information from flagship shops of the three brands on JD.com (京东), Nut bundle from Three Squirrels (三只松鼠) costs an average of USD 12.22 per kilo, Bai Cao Wei (百草味) costs around USD 9.71 per kilo, while BESTORE, possibly due to its high packaging cost, ranked the highest, USD 28.55 per kilo. The expensive nut gift pack for the Chinese New Year is perhaps well affordable to Chinese families these days; but it does not mean ordinary Chinese people would fancy the idea of buying something exactly the same at three times of the original price, getting some colorful but useless packaging paper wastes afterwards. In order to look a bit more common people friendly and less like a greedy businessman, the brand could experiment the high price strategy in this special period, and if it did not go well, maybe lower the price level and quit from the experiment later. Two brands of the top three had employed celebrities to promote their products for this special time in China: Bai Cao Wei invited the Chinese teenage star Jackson Yee from the popular teenage boy band TFBoys, the aim is very obvious, to attract attention from the younger generations, after all, the major consumer group of the snacks had always been them. While BESTORE also spent a large sum on this, hiring two popular adult stars, Dilreba Dilmurat, a Uygur origin Chinese actress, and Kris Wu, a Chinese Canadian singer and actor; they are clearly trying to win the modern and young Chinese populations in this season. 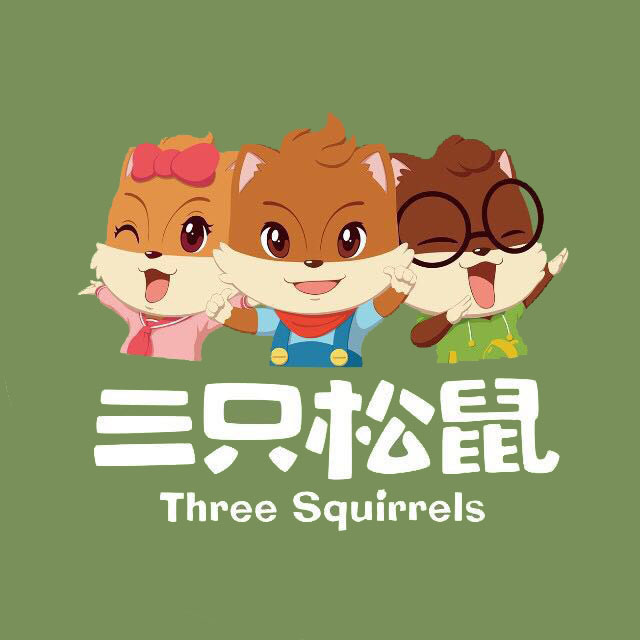 However, the Three Squirrels in this case, still believes the charm of its cartoon figures, not searching any help from the Chinese celebrities. Whether the squirrels are cute enough to support the brand to crown the New Year Shopping hysteria or not, only time will tell. All three had special gift set design for the special period: Three squirrels, still presenting the squirrels in 4 different color based common cubic boxes, as always, cuteness makes enough splash for them. Bai Cao Wei, on the other hand, features traditional and classic Chinese Lunar New Year style, which includes a series of shades of red, Chinese fan, the image of the big dinner on Chinese New Year’s Eve, and sceneries of Chinese people playing with firecrackers. The brand offers 9 options, which are the carefully selected, various combinations of different nuts. While BESTORE, though the design lacks the traditional Chinese New Year atmosphere, it offers a fresh image of the modern and fancy New China, with a touch of western, or international flare. In product innovation, Three Squirrels performed quite ordinarily again with almost nothing creative to offer except a drink combining milk, coffee and nut powder called The Second Brain (第二大脑) released a few days ago and yogurt bars. The interesting fact is the drink was obviously designed for young people, but if children's diet involves a large amount of caffeine, it could cause detrimental effects on their brain development. Bai Cao Wei, on the other hand, considers a lot for its customers, offering healthy and innovative snacks, such as freeze-dried vegetable and fruit without coloring and additives, and "one bite fruit juice", which is a bite-size, 100 grams soft cube formed by about 800 grams of fresh fruits, also no additives included. Needless to say, this is definitely the new trend in FMCG industry in China now and the future: Green, fresh, no additives, healthy and tasty. BESTORE, offers products quite similar to Bai Cao Wei, but not as innovative and thoughtful yet. It has many options of freeze-dried vegetables and fruits, Lou mei snack like the other brands offer, it also has the yogurt bar as Three Squirrels, but not enough innovative and healthy snacks to offer. What's worthwhile to be mentioned is, BESTORE, offered a very rare type of New Year Gift Set, the Duck Parts New Year Gift Set, which stands out in the crowd of New Year Nut Gift Packs offered by other brands. This may register success in this season because it is the only brand eyes on the Chinese's weird tongue for animal parts. The pack includes duck tongue, duck wings, duck foot, duck offal and the like, all are Lou mei snacks. According to the chart, the company's revenue growth rate in 2016 was 36.20%, above the industry average of 20%, decreased to 11.92% in 2018 (data only includes the first half year's revenue, the 2018 yearly revenue is estimated based on this), showing a quite significantly slow down. Its competitors, to the opposite, had not experienced a similar trend. For example, Bai Cao Wei, has remained its whopping 40% growth rate in the first half year of 2018, claiming to have more than 55,000,000 consumers; Three Squirrels claims to have about 70,000,000 consumers as well. Bai Cao Wei even achieved its goal of earning profits in the low season of snack purchasing in China, Q2 of 2018, which was a big success compared to its usual revenue deficit in the same period in previous years. Nevertheless, BESTORE still enjoys an optimistic environment in China, where the industry average growth rate exceeds 20%. By estimation, the market size will grow into a scale of CNY 2,000,000 million (USD 294,610 million) by 2020, thanks to hundreds of thousands of snack producers in China. Also, the technology barrier of snack producing business is quite low, comparing to the other industries. Hence competition can be furious, but this also brings benefits to the companies which cannot rank the top; since the top companies cannot dominate the market, all brands, regardless of the size and product quality, they can always find customers in the market and survive. The flourishing of the snack industry is arguably good news for BESTORE, if the company made wise moves and it might have the chances of crowning. High-End Snack, Ineffective Market Positioning? A snack is a small serving of food and generally eaten between meals. It had always been pictured as something down to earth, even the content of British royal afternoon tea closely resembles the afternoon tea offered in common tea houses. When the snack brand picture itself as a high-end indulgence, it is separating itself from the general public. The essence of high-end snack should lie in the quality of the snack, not excessive packaging. The high-end product positioning of BESTORE comes with extravagant packaging, which contributes a large portion of the cost, therefore, the price of the snacks are set pretty high to cover the costs. As temporary marketing methods, the positioning might yield benefits; They will fail to aid with the sales of the brand in the long term. Brick and Mortar Store, the opportunity to win? Though BESTORE has launched the very first brick and mortar shop as early as 2006, their shops had never gained enough attention, snuggling in unattended corners lack of touch from the public. There are only 4 shops within the Beijing fourth Ring Road after 13 years. Comparing to its peers, the brick and mortar shop should be its paramount competitive edge, since the others are mainly focusing on online sales. But arguably, BESTORE had wasted the abundant opportunities generated from its physical stores due to wrong locationing strategy and possibly not effective enough management of its retail outlets. The top two brands in China snacking industry, Bai Cao Wei and Three Squirrels, had always been neglecting its brick and mortar shop sales. The reason behind this is probably they had found out that, customers usually randomly choose one snack pack on an online store, such as JD.com, Tmall, and Pinduoduo, then if after consumption, the taste or general experience was not satisfying, they will quickly opt for another brand online, until they find the best among them all and settle. Also, the cost for these trial and error is not excessive because the unit price for snacks from any brand is not significantly differentiated from each other, and in most occasions, capped at a fairly low level. The trial and error period cannot last too long either since the customer might as well buy a few packs from different brands and have a tasting test of them all in one purchasing. Hence the online sales are probably sufficient enough, further marketing efforts or opening of brick and mortar stores are not urgently needed for expanding sales. In order to stand out, BESTORE really should choose eye-catching locations with heavy customer flow on high streets, such as Xidan Joy City Area, The Place (Shimao Tianjie) and Taikoo Li Sanlitun shopping arcade in Beijing and the like. Exaggerating decorations and sense of romance and cuteness could successfully attract young couples, children and teenagers, who are the main consumers of nuts and snacks, and have the tendency of impulse purchasing in China. Apart from generating more sales, the newly opened physical stores could further help the company to promote its brand image to the public, this will surely lead to revenue surge later. BESTORE is a snack brand in China with over 2,100 stores covering 13 provinces.